LinkedIn Sale Navigator Extractor extracts data from LinkedIn and Sales Navigator. This tool can captures contact information such as first name, last name, email, phone number, twitter, messenger id, job title, company, website, skills, industry, country, profile link from LinkedIn and Sale Navigator. Companies can obtain important information from LinkedIn, whether you are looking for experts in various fields, service providers or new clients. Unfortunately, however, it is not easy to extract this information and store it in documents or spreadsheets for later use. To Extract missing email, phone in profiles Download "LinkedIn Missing Data Extractor"
This is where LinkedIn Sales Navigator Extractor comes into play, as it enables you to grab contact information from LinkedIn and export it to CSV, XLSX or TXT files. Moreover, the application offers support for the Sales Navigator service. LinkedIn Sales Navigator Extractor is a desktop application which allows you to extract endless number of data from LinkedIn and Sales Navigator at an exceptionally fast rate. 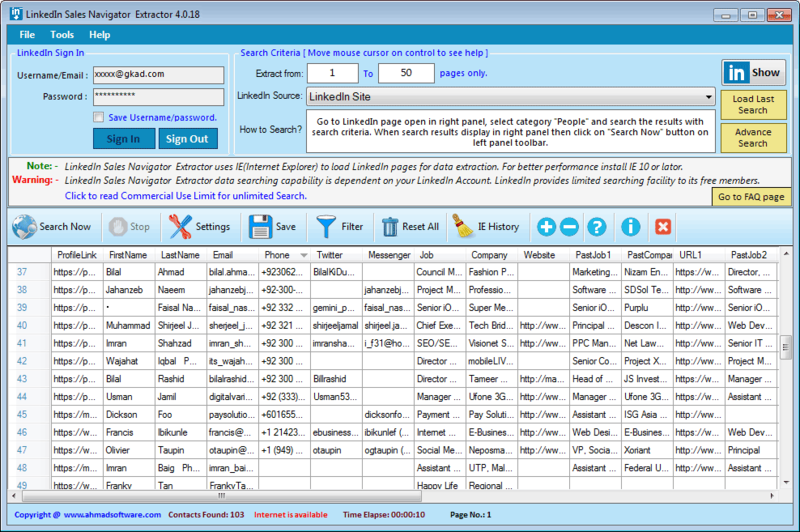 It automatically extracts Business Name, Email, Phone Address, Yahoo messenger id, Skype Id, Google Talk ID, etc. You can export your data in .xlsx, .csv,(opens in excel) .txt files. LinkedIn Sales Navigator Extractor can extract your targeted customer's Linkedin contact information and complete profile. It can extract your targeted customer's data from sales navigator. Lead Extractor searches your targeted customers based on your search keywords. Using LinkedIn Advanced search feature, search for people by keywords, industry, location, company, experience level, and more. Sometimes computer/software shut-downs unexpectedly; don't worry you can recover your search results just by one click. LinkedIn Sales Navigator Extractor has the ability to save the history of viewed and saved profiles so that already saved profile should not view again. Option to set delay between requests to simulate as is human being is surfing in a browser. LinkedIn Sales Navigator Extractor support Unicode character-set. You can save fetched search results in Unicode format. LinkedIn Sales Navigator Extractor automatically pauses/resumes on internet failure during processing. You can also apply filters to get your targeted contact list. Software provides options to save extracted data in EXCEL format, .CSV files (Opens in EXCEL), TAB delimited (.txt files) format. Why Use LinkedIn Sales Navigator Extractor? LinkedIn has been creating buzz in social media circles for many years now, however many businesses are yet to fully capitalize on this remarkable tool for their online marketing and promotional needs. LinkedIn Sales Navigator Extractor is the best tool to get contact information from LinkedIn and Sales Navigator according to your business needs. Sales prospecting is now easier. LinkedIn Sales Navigator helps you find the right prospects, fast. With LinkedIn's sophisticated algorithm, this sales tool gives you lead recommendations that are tailored to you. Easily save leads and follow updates of your prospects to turn cold calling into warm conversations. Something about what is LinkedIn? This might appear a rather simplistic question; however it is important to understand that LinkedIn is not merely a social network aimed for business users. Rather, it should be viewed as an online network of influential people all over the world. For most individuals, gaining contact with the most powerful people in business is one of their biggest challenges. Getting round conventional 'real-life' obstacles, LinkedIn essentially brings business people together in a new and unique way. If utilised properly, this tool can even allow the humble office junior to engage in discussion and build connections with company CEOs. Whatever your business objectives, LinkedIn will help you to build a network of useful contacts. Simple searches in your field will reveal thousands of experts, service providers and potential clients. If you do not personally know an individual, you may request to be introduced through a mutual contact or can send an introductory email. If your business is recruiting, LinkedIn can provide easy access to potential candidates. There are both paid options and those involving no financial outlay. Businesses can search for candidates that fit their required level of expertise and approach them directly, provided they are at least '2nd degree' contacts. In order to search further afield, a monthly subsciption is needed. However, even the basic or 'business' package allows users to contact any individual with a LinkedIn profile.Whatever your recruitment objectives, LinkedIn is the ideal networking site to find the connections you need to grow your business and here is LinkedIn Lead extractor to help you. Basic Account: 100 profiles daily. It has monthly limit as per the number of first degree connections in your account. On ending monthly limit it will not allow to extract further. Business Plus: 350 profiles daily. Sales Navigator: 1200 profiles daily. LinkedIn also blocks user accounts/IP address if too many requests are fired within a certain time limit. For example 70 - 100 requests in 2 - 3 minutes therefore apply proper random delay on software settings. LinkedIn provides Email address, Phone, Website, Address of the connections for all your first degree connections but in case of second, and third degree connections, email addresses will be available only if LinkedIn member has made email address public. Same will apply to your out-of-network connections. Software extracts only what LinkedIn provides. The product may not work properly or show error if there is any change in linkedin.com structure. Note: Our request to our customers that our extractor products are for personal use only and to use all/any information fetched through them in an ethical manner. Ahmad Software Technologies is not responsible for any misuse or unethical or illegal activities done by any one using our Products. Our extractor products are based on the flow that can be executed through manual efforts.